When Jennifer Pan and Yiqing Xu posted their new paper, “China’s Ideological Spectrum,” last week, it marked the first time that anyone has provided large-scale empirical data on the ideological shifts and trends within the Chinese population. China scholars have, of course, lavished attention on these issues for years—one cannot build a coherent argument about Chinese political and social change without grappling with them—but their arguments were largely based on personal experiences and anecdotes. The Pan and Xu paper therefore did academic and policy circles a significant service by providing a firmer foundation for such discussion. A quick survey of the current Chinese intellectual landscape tends to reinforce these correlations. With some noticeable exceptions, China’s most visible Neo-Confucian advocates have, in recent years, often displayed a fairly strong affinity for leftist socioeconomic positions. Correspondingly, a number of prominent leftist intellectuals have argued for ideological continuity between Confucianism and Chinese Socialism, or, to quote the prominent Sun Yat-sen University scholar Gan Yang, “tong san tong” (“connecting the three canons”). It is hard to escape the impression that there has been a budding relationship between “cultural conservatism”—or, at least, the Confucianism-oriented version discussed in the Pan and Xu paper—and the Chinese Left. This is a curious development indeed. Historically, the relationship between the Left and “cultural conservatism” has been predominantly antagonistic, to put it lightly. For most of the 20th Century, leftists led the charge against what they routinely condemned as China’s inhumane and counterproductive “traditional culture.” Confucianism, in particular, was the target of multiple political and intellectual campaigns, ranging from the May 4th Movement to the “Criticize Lin Biao, Criticize Confucius” campaign during the Cultural Revolution. Moreover, the ideological incompatibilities between the mainstream political views of early modern Confucian literati and the contemporary Chinese left are serious. Many, arguably most, Qing dynasty (1644-1911) elites believed strongly in limited government, lineage self-regulation, and economic decentralization. Correspondingly, the Qing state apparatus was extraordinarily small even by early modern standards, pulling in only a fraction of the annual revenue (relative to estimated GDP) that the early modern Japanese and English states collected. Most contemporary Chinese leftists champion the opposite position: They press for more robust state intervention into socioeconomic life, and perhaps for a partial return to a state-planned economy. All in all, the recent convergence between “cultural conservatism” and “leftism” represents a dramatic reversal of some longstanding and deeply-entrenched ideological positions. Ideologies do, of course, transform over time. In particular, an ideology that has experienced as much turbulence as Confucianism is bound to evolve, perhaps radically, to appeal to modern populations. Nonetheless, one still has to wonder why the modern transformation of Mainland Chinese “cultural conservatism” took a predominantly leftist-friendly turn, as opposed to a more liberal one. A precursor movement in Taiwan and Hong Kong during the 1950s and ’60s, for example, produced a version of “Neo-Confucianism” that emphasized its compatibility with Western democratic and free-market ideals. Why did Mainland “cultural conservatism” turn in a different direction, and, equally importantly, why were Mainland leftists willing to embrace—or at least tolerate—such a turn? One could potentially answer this question by rehashing the old argument that Confucianism is inherently “pro-government” or “pro-authority,” and therefore naturally inclined to lean “left,” rather than “right,” on the current Chinese political spectrum. This relies, however, on a flawed conception of Confucian political ideology: As noted above, many late-Qing Confucian elites were more likely to ideologically support a decentralized socioeconomic and political system than a state-controlled one. Alternative perspectives certainly existed, but it is nonetheless difficult to argue that Confucianism is inherently “pro-government” in the contemporary leftist sense. 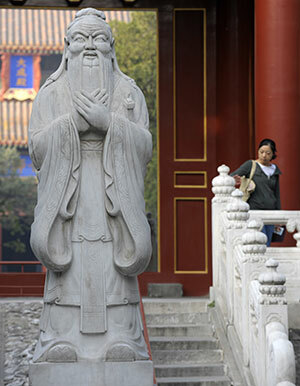 A statue of Chinese philosopher Confucius stands at the Confucius Temple in Beijing. Compelling as it may seem, this argument, too, has some empirical difficulties: Until the past few years, the dominant socioeconomic or political positions in the Chinese intellectual world were clearly liberal ones: most intellectuals argued for greater institutional restraints on state activity, free-market reforms, and stronger protection of civil and political rights. Even today, Pan and Xu’s paper finds that highly-educated individuals are generally more “liberal” than less educated ones. When “cultural conservatism” reemerged as a somewhat influential ideological position during the later 1990s, its proponents could arguably reap greater social benefits by developing a liberal affinity, rather than a leftist one. For the most part, this did not happen. Why not? Reading the early work of prominent contemporary “Neo-Confucian” intellectuals such as Jiang Qing or Chen Ming, one feels that this was a carefully considered—even principled—decision: they saw themselves as defending “Chinese traditions” against a distinctly hostile “Western liberal” intellectual mainstream. The “other” they defined themselves against was not some version of socialism or leftism, which at this time was clearly a minority position, but rather a supposedly intolerant “liberalism” that had dominated Chinese sociopolitical thought since the 1980s. Whatever one thinks of this position, there is probably some truth to the claim that the Chinese intellectual world of the 1980s and 1990s was both predominantly liberal on political and economic issues, and distinctly hostile to “traditional culture.” The enormously influential documentary series River Elegy, which combined express attacks on Confucianism with thinly-veiled criticisms of the party-state apparatus, is but one example of this. Chinese liberalism was indeed often critical of traditional family structures, social hierarchies, and what it perceived as “backwards” elements of Confucian political and economic thought. In the intellectual world, at least, Chinese “cultural conservatism” and leftism did share two important commonalities: both were minority positions facing a perceived liberal majority, and both encountered significant hostility from this perceived majority. Ideologies regularly define themselves against a perceived “other,” and in this case there was quite plausibly a common and powerful “other” that both “cultural conservatism” and political leftism defined themselves against. This may, in fact, be the missing explanatory element. Ideologies regularly define themselves against a perceived “other,” and in this case there was quite plausibly a common and powerful “other” that both “cultural conservatism” and political leftism defined themselves against. This also explains why leftists have, since the 1990s, become considerably more tolerant, even accepting, of “cultural conservatism” than they were for virtually the entire 20th Century. The need to accumulate additional ideological resources to combat a perceived “Western liberal” other is a powerful one, and it seems perfectly possible that this could have overridden whatever historical antagonism, or even substantive disagreement, existed between the two positions. If this is true, then one of the most important takeaways from Pan and Xu’s paper is that the educated Chinese population continues to formulate its ideological positions either against or in support of some perception of “the West.” In some fundamental way, we continue to define ourselves vis-à-vis the “Western other.” This is, in fact, how the Chinese intellectual and political world has operated since the late Qing, when the influx of Western technology, institutions, and thought forced Confucian elites to fundamentally reorient their ideological commitments. Perhaps more than any flawed conception of “Confucian culture,” this is what we should be grappling with when considering the influence of “historical tradition” on contemporary Chinese society.